Light: Light is a form of energy which helps us in seeing objects. When light falls on an object, some of the light gets reflected. The reflected light comes to our eyes and we are able to see an object. Luminous Object: An object which produces light is called a luminous object, e.g. sun, bulb, etc. Non-luminous object: An object which does not produce light is called non-luminous object, e.g. moon. Light always travels in a straight line. This can be proved by a simple experiment. For this, take a cylindrical tube; which can be easily bent. Try to see a source of light; like a bulb or a candle; through the straight tube. 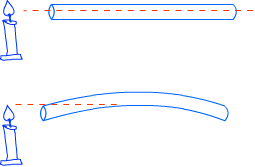 Once the tube is bent at some angle, it is not possible to see the source of light through it. This happens because light travels in a straight line. Transparent Object: An object which allows complete passage to light is called a transparent object. We can clearly see through a transparent object. Translucent Object: An object which allows partial passage to light is called a translucent object. We can see through a translucent object but the vision would be faint. 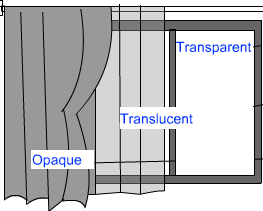 Opaque Object: An object which does not allows passage to light is called an opaque object. We cannot see through an opaque object. When light falls on an opaque object, a dark patch is formed on the other side of the object; if a screen is present on the other side. Three things are required for formation of shadow, viz. a source of light, an object and a screen. The size of shadow depends on the distance of source of light and on the angle at which the light rays fall on the object. If the source of light is closer to the object, a larger shadow is formed than when the source of light is far from the object. If the angle of incident light is smaller, the shadow is longer. On the other hand, if the angle of incident light is bigger, the shadow is smaller. This explains, why our shadows are longer in the morning and evening and smaller in the noon. A pinhole camera is simple device. One can get an inverted and real image in a pinhole camera. A pinhole camera is composed of two boxes. One of the boxes snugly fits inside another box and can be slid to and fro. There is a pin-sized hole at the front of the camera and a translucent screen at the back of the camera. The distance between the pin-hole and screen can be adjusted to obtain a clear image of an object. When light falls on a shiny surface, the light rays bounce back. This phenomenon is called reflection of light. Mirror is a surface from which most of the incident light gets reflected.